Enchanting, timeless and surprising - this extraordinary novel will touch the hearts (and ears) of children and adults alike. Dr Boogaloo was no ordinary doctor. Not at all like the one you might go and see if you had the flu. 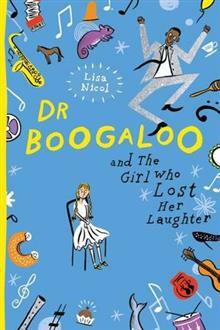 No, Dr Boogaloo was a very different type of doctor i... read full description below. Enchanting, timeless and surprising - this extraordinary novel will touch the hearts (and ears) of children and adults alike. Dr Boogaloo was no ordinary doctor. Not at all like the one you might go and see if you had the flu. No, Dr Boogaloo was a very different type of doctor indeed. He treated folks who suffered from, well, let's call them unusual complaints. And how did he treat them? By using the most powerful medicine known to mankind ...Music. Blue was no ordinary ten year old. For starters her name was Blue. But what was truly extraordinary about Blue was the fact that she hadn't laughed for 749 days. It was as if a cocoon was ever so slowly being wrapped around her. With each layer, the world became more muffled and distant. Although she knew there were much more important wishes to be had, Blue only ever had one ...She wanted her laughter back. Can Dr Boogaloo compose a cure before Blue loses her laughter forever? Lisa Nicol is a writer and documentary-maker. Working across film, television, radio and print, Lisa's work has been broadcast on ABC TV, pay TV networks and Radio National. Her documentary about Australian poet Benjamin Frater won a Silver medal at the 2012 New York Festivals International Radio Program and Promotions Awards. Wide Open Sky is her first feature-length documentary - it won the Audience Award for Best Documentary at the 2015 Sydney Film Festival and gained a national cinema release.